The Voice Recognition Checklist App is specially developed to be used in any activity, which requires strict abidance by rules, ease of movements and logical sequence of taken steps. The App can be easily adapted to any industry, which not permits human mistakes and random actions. Within Anesthetic Process, as well as any other medical procedures, the most vital task remains to guarantee safety and comfort of patients. Pursuing this aim anesthesiologists get to use Anesthesia Safety Checklists to ensure that all significant measures are taken and the patient’s anesthetic is managed by recognizing and minimizing risks. to maintain effective team communication. It is not the checklists themselves that are important, but the effective performance of the safety actions and communication. To help doctors in managing above mentioned tasks, Softengi has developed a Voice Controlled Anesthetic Checklist App. When Softengi’s team started its work on this project, we had a lot of tasks to accomplish. 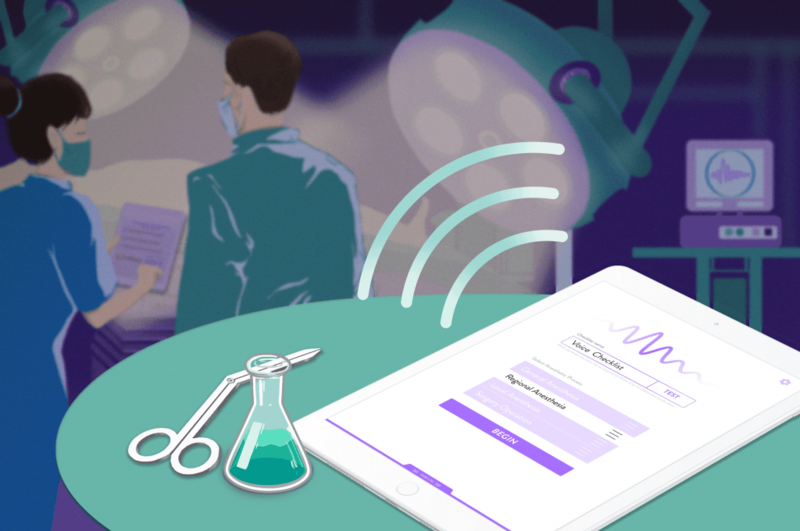 First of all, our client asked us to develop an app that could free the anesthetists of using their hands while applying safe checklists within an anesthetic process. Moreover we strived to provide anesthetists and their teams with easy access to different anesthetic and surgery checklists, ensuring the highest level of interaction between team members. So our goal was to make a voice controlled App, which would be user-friendly, fully functional, customizable, and highly stable. Due to the offline voice control technology and more than 20 functional settings available for the App, Softengi succeeded in meeting the client’s requirements. Voice Controlled Anesthetic Checklist App is an application allowing anesthetists and their teams to manage different surgery checklists within anesthetic processes using only their voice. In the operating room doctors uses voice commands to check each item from the anesthetic checklist in a logical sequence: “anesthetic machine check”, “enough oxygen available”, “breathing system connected”…The Application informs the team, which action has been performed and which action should be performed next. With that, the anesthetist doesn’t even hold the device or look at the screen. Using Voice Controlled Anesthetic Checklist App give doctors extra value, which might not be obvious to everyone at first. Offline voice recognition is ensured. If your hospital doesn’t have permanent internet connection or your Wi-Fi works intermittently – it will not hinder your work and the safety of the patient is ensured due to the fact that. App reminds you about all the logical consequent points of the anesthetic checklist. All interactions with checklists are performed through voice commands. You are completely concentrated on the process, not distracting on switching tasks on the table or checking the next step at the screen. All checklists can be personally created, modified, imported, or exported with the ability to develop – if required – logical checklist chains. You will easily adapt your anesthetic procedure according to each patient’s needs and requirements, taking into account the health and safety of your patient. The App works in background and can be used with other apps running in foreground. Meanwhile using the Voice Controlled Anesthetic Checklist App, you can also use any other action on your device. The App allows you to divide checklists into customizable groups and categories, thus creating a clear and comfortable users structure. After installing the Voice Controlled Anesthetic Checklist App, you will have all your anesthetic checklists procedures in your personal organizer. In other industries involving inspections, investigations, security checks, audit, or inventory checks. Implementation of a double check mechanism, supposed that safety steps are checked twice: by the doctor himself as well as by the nurse using the Voice Controlled Anesthetic Checklist App. Reducing anesthetic errors by as much as 9% (provided that previously checklists were used within the anesthetic process in the common way, but without Voice Controlled App); An 11% rising indication of successfully completed surgeries.